Breakfast: egg salad with mustard and cayenne on a Wasa, 1 tomato, 1 deliciously messy plum (you are spared the gory spectacle of me devouring it), coffee, cat and comics. 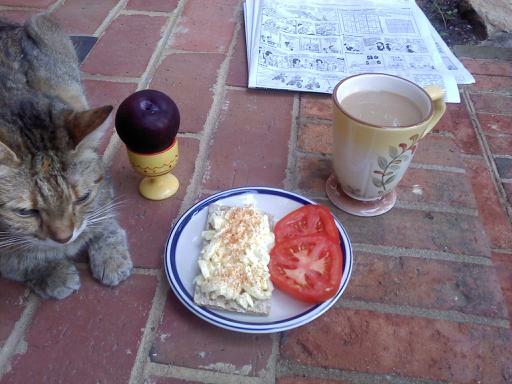 Second day in a row that breakfast has been this leisurely, and I'm off work tomorrow so it will happen AGAIN! I am so spoiled. Then work work work all day, with a salad for lunch and a Zone bar and a totally gross-looking and delicious green smoothie for pre-workout fueling. Then...CROSSFIT! Dun dun dunnnnn! This was the last day of this session, so I knew it would have to be something horrendous. Little did I know...just how right I would be! Muahahahahaha! 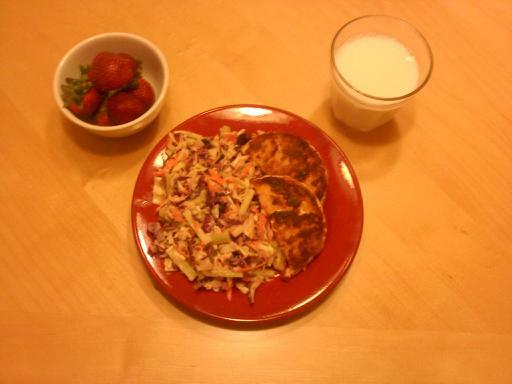 Dinner was amam's coleslaw, a salmonburger, a big handful of strawberries and some milk. And some chocolate. My uterus made me do it. So I looked at one of those healthy-weight charts and saw that I'm about 15 lbs higher than the "ideal" weight for my height. Given, I've got a bit more muscle than average, but that doesn't account for anywhere near all of that...and besides, it's all kind of swathed in pudge right now. So I'm reinstating the plan I had last summer: namely, doing semi-strict Zone 6 days a week, upping my weekly mileage (at one point last year I was at a solid 5k 3-4 times a week, working my way up) and switching to nettle tea instead of coffee. This last one I will ease into. Very slowly. Bed time! Farmers' market day tomorrow! Dude your workout was intense! You SO rock! Joanne, thank you! Our workouts aren't usually quite THIS intense, but every now and then we do a real challenge. I love it - I feel like a superhero afterwards, even if I have to crawl through some parts!